At the beginning of the Degrees the Master gives this charge “The ceremony you are about to witness is to introduce you to the ritualism of the Grange. There is far more to the Grange than ritualism. The underlying philosophy of the Grange is portrayed by the oldest and most successful method of communication known to man – the use of symbols. The staves carried by the Steward, Assistant Stewards and the Gatekekeeper, the working tools of the Order and the capes and blindfolds to be worn by the marching candidates at the beginning of the First Degree, are all a part of that symbolism and will be fully explained at the appropriate time. We old-timers remember this passage as we began our Grange journeys, but many new members have never heard this passage, or heard an explanation of the symbols of our Degrees. This charge is also in a Public TV show of two Community Granges in Vermont that follow their service to the community, which will air in Vermont in April. These lessons bring the true meaning as to what the Grange is all about if we don’t use or explain it to new members then they will be at a loss regarding what the Grange is all about. The FFA uses symbols for their officers in their opening and closing ceremonies. The first weekend of March Marcia and I attended the State Masters’ Conference in Portland, Oregon. Because of a Nor’easter snowstorm, many Masters had missed flights. But we persevered and had a good conference. The National Grange building’s AC/heating system is almost complete. While removing the boilers they found the fire pumps were inoperable, and circulator motors were not working as well, these will be replaced during the upgrade. The system manager will also be reviewed as to servicing of these systems. National Grange is also working with outside organizations so Grange members can do more community service projects. The National Grange has become a recognized partner in the mission of Quilts of Valor Foundation as an official Under Our Wings Program. If you would like to sew quilts, quilt tops, presentation cases, or non-quilters can supply space in your halls for “sew days”, resources of batting, fabric, long-arm services, and funds. WEATHER-READY NATION, 4 ways Grangers can become Citizen Scientists - SKYWARN storm spotters - The National Weather Service Cooperative Observer Program, taking observations where you live, work and play. MPING reports Precipitation, (Meteorological Phenomena Identification Near the Ground project). Join the CoCoRaHS Community–the Community Collaborative Rain, Hail and Snow Network- observing and measuring precipitation from your backyard. All these new programs are on the National Grange website (www,NationalGrange.org). Check them out and see if your Grange is willing to take a chance at something new. The National Grange is also selling chances for a queen size “Garden Path” quilt, and Spiderweb Star Quilted table runner, and a hand-painted Patriotic Saw. I have tickets for this raffle. The drawing is at the National Grange Convention in Stowe, Vermont. April is Grange month, it is the time to open up our halls and invite the public in to Celebrate National Grange being 150 years old. 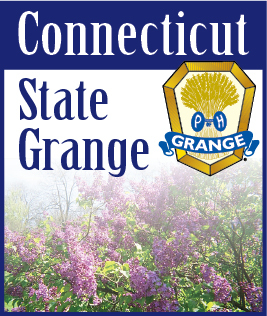 National Grange has items that you can download, one being a Grange Banner. Check it out and show your Grange Pride. Congratulations to Greenfield Hill Grange on their 125th Anniversary. We, as Grangers, need to help and support each other during these trying times, if there is a Grange in need help them out. That’s the Grange Way.